What Tricks Will The Insurance Company Use If I Am Hurt In A Wreck? Delaying a reasonable offer -The insurer knows that medical bills add up and cause financial strain. On top of that, you may not be working due to your injury. You feel pressured to give in and settle cheaply. The insurer, of course, is fully aware of this. Befriending you and stringing you along – The best insurance adjusters attempt to make you feel as though you have found a new friend. They express personal concern for you and your family and sorrow for all you are experiencing. They promise to pay your future medical bills to stop you from hiring an attorney while they request a recorded statement and ask you to sign medical authorization forms and provide them with a slew of other personal information. Be on the lookout! Requesting unnecessary information – As its adjuster befriends you, the insurance company is busy gathering medical records from every physician whose name you have provided. This will include past physicians whose treatment had nothing to do with the injury in question. Did you sign an employment authorization? If so, the insurer is requesting your entire employment file from every place you have ever worked – relevant or not. The insurance company is looking for prior injuries and other reasons to argue that you were not truly hurt. Or maybe it is looking for other ways to discredit you. The insurer may look for claims for unemployment, divorce proceedings, criminal records or other personal information. It is likely spying on you and conducting video surveillance to see if your description of your injury and pain to your physician squares with your activities. The insurance company will also look for you on YouTube, Facebook, Instagram and other social networking sites. They will “Google” you as well. Disputing valid medical treatment – Adjusters with no medical training often argue that your treating physician is over treating you. They may dispute certain forms of treatment and may even have their own paid for doctors say your treatment was not necessary. “Nickel and Dime” the medical charges – they do this by agreeing the treatment is necessary but saying they can only pay for a portion of it. Be on the lookout! Misrepresenting insurance policy benefits – Often the insurer refuses to tell you the amount of existing insurance coverage available; or worse, the insurer actually misrepresents the amount or type of available coverage. Making false promises – Adjusters sometimes promise injury victims they will continue to pay medical bills every month until fully recovered. But this does not last. Or, they stop paying after you sign something. Why? These are some examples of deceptive tactics insurance companies may employ to wear you down and help them pay as little as possible. HURT IN A WRECK – GET HELP NOW! 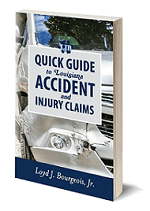 Before you talk to the insurance company or fall for any of these tricks, you need to need to read my book or speak with a local personal injury attorney who can help you avoid these mistakes. Loyd J. Bourgeois stands ready to help. 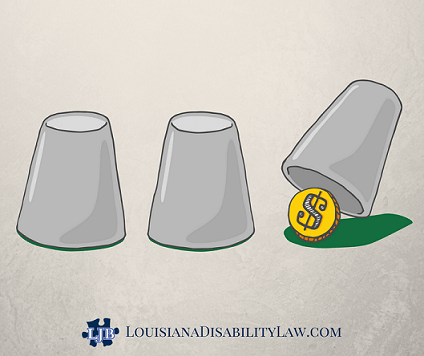 Contact us to schedule your FREE legal consultation – (985)240-9773.